At the end of November – beginning of December the Tiare Festival takes place on Rarotonga. ‘Tiare’ means flower and this is the time of year when gardens, trees and bushes are usually in full bloom. I went to New Zealand for a short holiday so I wasn’t around for most of the festival but I get the impression that there wasn’t a great deal of participation in things like the decorated buildings and flower arranging events. Usually shops, banks and government offices are decorated with flowers and foliage and everything looks very colourful for a week or so, but there are very few signs of anything like that. Mind you, there aren’t many flowers around either. The weather was dry for a long time which knocked back flowering plants. Then we had high winds to blow blossoms off the branches followed by torrential rain that flattened anything that had survived. I definitely picked the right time to head to Auckland. The forecast was dismal but it turned out to be pretty good weather, especially last Sunday (30 November) for the Farmer’s Santa Parade. It was sunny, probably too hot if anything. Thousands of people, four or five deep in places, lined the parade route – Mayoral Drive, Queen Street, Custom Quay and Albert Street, and there were so many floats the first ones were coming up Albert Street when the tail-enders hadn’t even got onto Mayoral Drive. Some of the little kids looked exhausted by the time they’d finished. Back home on Raro, the Tiare Parade took place on Saturday (6 December). Well, things have changed. 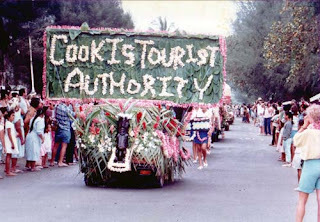 For a start there are fewer people in the Cook Islands and this year there were fewer flowers too. The ‘parade’ is now simply the last opportunity to see the Miss Tiare contestants as they drive through town and back again to the National Auditorium where prize winners are announced. ‘Miss Tiare’ is a junior beauty pageant for senior secondary school girls involving giving a speech thanking the sponsor, wearing pareu and a talent section. The organisers arrange for the girls to have lessons on deportment and things like that and they seem to enjoy it and get a lot of confidence from the event. The video shows the contestants getting ready for the parade and driving along the main road. One thing hasn’t changed over the years – it was over an hour late starting!